Pwera Usog, a horror movie under the production of Regal Entertainment Inc., written and directed by Jason Paul Laxamana starring Devon Seron, Joseph Marco, Albie Casiño, Kiko Estrada, Sofia Andres, and Eula Valdez. It's released date will be on March 8, 2017 in cinemas. 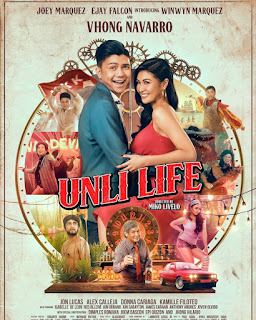 The story starts when Jean (Sophia Andres), a prankster had an idea to prank Luna (Devon Seron) a crazy beggar girl in order to put it up online. She gathered her team, Val (Cherise Castro) and Bobby (Albie Casiño) to do the prank to Luna and ended up in killing her. After that accident, something happened in each of them, getting mysteriously ill and it was fatal. One by one they ware foreshadowed by a dark spell. Sherwin (Joseph Marco), ex-boyfriend of Jean, got concerned of her illness and helped her. They went to an albularyo to seek help, and then they've found out the history of Luna and the connection to what is the real illness of Jean. It was an 'usog' given by Luna that caused her sickness. A movie of suspense and thrill, Pwera Usog is must watch for those movie goers who loves horror films and new faces of actors and actresses to freshen up the eyes of the viewers.